The most realistic coyote available just received a fur coat. Flocking the entire decoy emulates a fur like texture and appearance as well as reduces noise during transport and set-up. 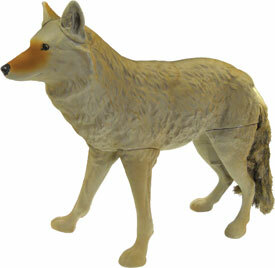 The faux fur tail with wire frame is posable and moves in the wind. The Lone Howler's bungee leg system allows the decoy to be easily transported and placed in a sitting or laying position. Simulate captured prey by attaching a white rag or rabbit pelt to the snout to elicit an instinctive response from approaching coyotes. 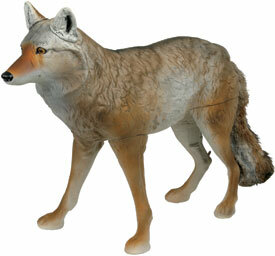 Life-sized, lightweight coyote decoy. Works great with any of our predator calls. Gives the coyote a sense of "ease" seeing another coyote when coming in to a call. Single stake allows for easy and quick set up. 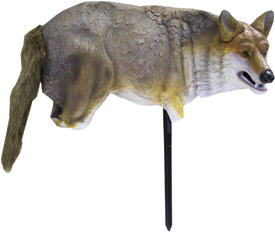 Decoy will rotate on stake with the wind and free moving furry tail adds lifelike realism. 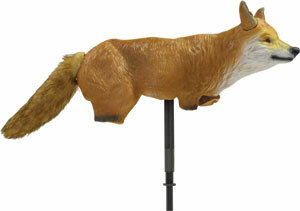 The Lucky Duck Foxxy Fox is great for predator hunting or even in your garden to help keep those unwanted critters out! Foxxy is made of lightweight EVA rubber that allows for easy folding for storage or just getting out into the woods. Includes a 2 piece stake, and a faux fur tail that moves in the slightest breeze making her look so real. Endorsed by Rick Paillet - Verminator.